I hope yall had an amazing weekend celebrating our Risen Savior. We had a fabulous weekend filled with friends, family, church, picnics, egg hunts and Easter lessons for little people. This year, we did resurrection rolls! 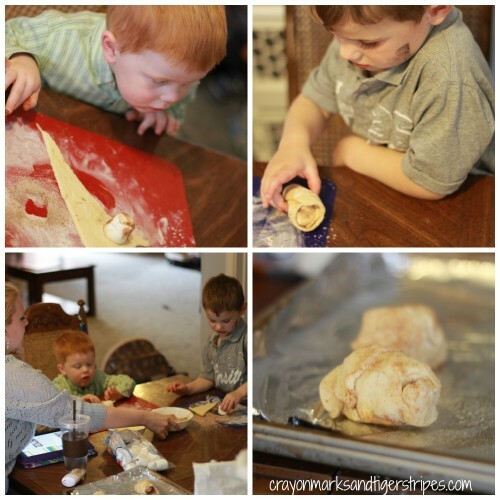 Some of our very close friends stayed for part of the weekend with us to celebrate so we decided that our 3 year olds were at a good age to introduce resurrection rolls. Priority Ministries has a perfect tutorial for this activity and we will use it for many years to come: A Step to Step Guide to Sharing Christ with Resurrection Rolls. It was really fun watching the gears in their little minds work as we talked about what Christ did for us. Love the photos! So glad your little boy enjoyed his new Easter tradition! He did and so did his mom!! Thanks for providing such an awesome tutorial!